Nerf N-Strike Elite Firestriker Blaster Bundle | A Savings WOW! Today only, Friday, July 18th, get this Nerf N-Strike Elite Firestrike Blaster and Elite Dart Refill Bundle for only $9.49 at Kmart. The regular price is $18.98, so you are getting an awesome deal! 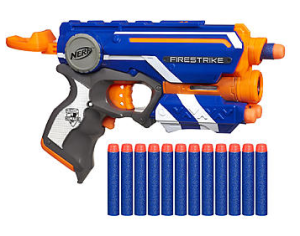 The Nerf N-Strike Elite Firestrike Blaster WITHOUT the refills is $14.99 at Toys R Us, so you are getting a double bonus! I love stocking up on deals like this for my gift closet. (Plus, if you are looking for something fun to do with the kids this summer, Nerf is a good way to get them active and settle any sibling disputes in a fun way.) You can select store pickup for free or have it shipped to you. Make sure you use your Shop Your Way Rewards when you purchase it so you can earn rewards points on this purchase (or use your points to buy it if you’re already a member).